Artist's rendition of space junk surrounding the Earth. 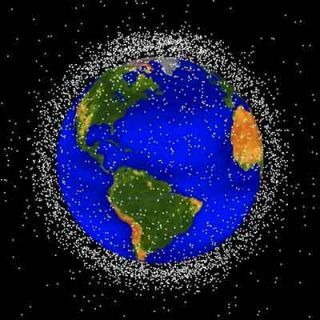 There are well over 100,000 objects in Earth orbit, the vast majority being non-functioning junk in the form of satellites and debris from rocket launches. Nuts, bolts, chips of paint and other garbage all pose a threat to satellite operations. Having all this material speeding along at 17,500 miles per hour only a few hundred miles above us isn't of much concern for people on the planet, because although hundreds of objects fall back to Earth every year, almost all burn up in the atmosphere (with the exception of a few huge rocket parts). Earth's atmosphere acts like a closet door, preventing all our junk from spilling out and hitting us on the head. With no atmospheric barrier to shield the moon's surface, NASA is now taking steps to prevent a similar accumulation of debris in lunar orbit. "NASA's new robotic lunar exploration program and the eventual return of astronauts to the moon dictated that we address potential debris in lunar orbit," explained Nicholas Johnson, Chief Scientist for Orbital Debris at the NASA Johnson Space Center. "The new NASA procedural requirements for orbital debris mitigation identifies the issue of the disposal of objects in lunar orbit and assigns responsibilities for ensuring that end-of-mission actions do not pose a threat to future lunar missions or to operations on the lunar surface." This threat arises from the fact that any object dropping out of lunar orbit would impact the surface at a near horizontal 5,000 miles per hour. Very unhealthy for any astronaut in the line of fire and a potential danger to historic Apollo landing sites. "Even during the initial exploration of the moon in the 1960's and 1970's, efforts were made, whenever possible, to avoid leaving space hardware in lunar orbits," Johnson said. One reason for the extra caution is that lunar orbits are unstable. "The orbits of lunar satellites are normally chaotic and short-lived, due in part to lunar mascons," Johnson told SPACE.com. Mascons (short for mass concentrations) are regions of excess mass associated with the moon's large impact basins and may be due to dense solidified basaltic lavas lying beneath these ancient impact structures. This smattering of higher mass gives the moon an uneven gravity field and causes orbits to become unstable and spacecraft to ultimately impact the surface. Death by mascon has affected spacecraft in the past. The small Apollo 16 sub-satellite was released from the Apollo 16 Command Module in April 1972 but only lasted 35 days before its orbit decayed and it impacted the surface. The Apollo 16 sub-satellite was cast adrift in the name of science and helpfully transmitted its location to Earth but any non-functioning jetsam tossed into lunar skies will be far harder to track. "Non-operational spacecraft and other hardware left in lunar orbit cannot be tracked by the sensors of the U.S. Space Surveillance Network, which monitor man-made objects in orbit about the Earth," Johnson said. So, might there be other now defunct satellites still in lunar orbit at the mercy of the mascons that may pose a danger despite the new procedural requirements? "Very few of the U.S. and Soviet vehicles left in lunar orbit during the 1960's and 1970's are assessed to still be in lunar orbit. Any objects remaining in lunar orbit would necessarily have to be at relatively high altitudes," Johnson said.